I recently read through an article in a leading newspaper on "To boil or not?" 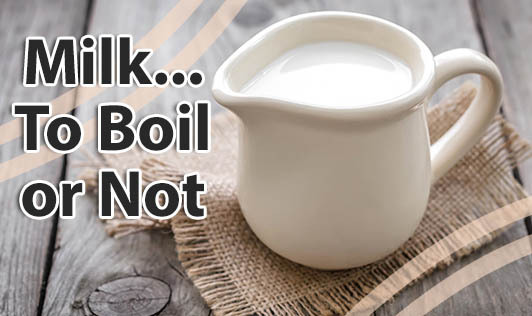 The article spoke about whether to boil milk which kills germs but also destroys nutrients. The article also gave tips on how to save nutrients while boiling the milk. It starts with - "milk is a veritable store house of nutrients. It is a rich source of protein, vitamins and minerals. Minerals like Calcium and vitamins like Vitamin A, D, B1, B2, B12 and K are found in good quantities in milk. Boiling affects many of these vital nutrients in your milk, depriving you of the nutrition they provide. Particularly vulnerable to destruction are the B group of vitamins". •Don't boil the milk at very high temperature for a long time. Reason: Boiling and re-boiling milk at high temperature for a long time affects the nutritional content of the milk, particularly the B group (B1, B2, and B12) of vitamins. Milk is a form of protein and the protein percentage could reduce, if exposed to excess heat..
•Don't leave your milk open after boiling. Refrigerate it immediately. Reason: After boiling when milk gets exposed to higher environmental temperature, microbial growth occurs which brings us back to boiling. So, to increase the shelf life refrigeration is a good option than re-heating the milk. •Don't heat your milk repeatedly. Reason: When milk is boiled repeatedly, the thick layer of cream that forms in the upper crust is not just fat; it also contains fat soluble vitamins, including Vitamin A, B, E and K.
•Don't forget to stir your milk while boiling. Reason: Stirring while boiling is believed to preserve nutrients and hence the right method; so, don't forget to stir the milk while boiling. •Don't use microwave ovens to heat and re-heat milk. Reason: Although microwaves heat food quickly, they are not recommended for heating or re-heating milk. Heating the milk in a microwave can cause slight changes in the milk properties. For baby's infant formulas, there may be a loss of some vitamins. In expressed breast milk, some protective properties may be destroyed. However, the best way to consume milk is by boiling it for not more than two minutes once. In case of pasteurized milk, boiling it for a minute or two increases its shelf life. However, every time before consuming the milk, there is no need to boil it. Rather boiling it once and heating the milk till a certain temperature is just fine. Moreover, tetra pack milk doesn't require boiling at all," If you have to boil your milk, make sure that you do it correctly; else simply switch to milk which doesn't require boiling.